"My Lady" joins the studio! KEA Woodturning Studio new lathe: "My Lady"
Last year I helped one of our new club members find a nice Powermatic lathe. The lathe belonged to my old friend and mentor, Cole Warren. Sadly, he's gotten out of woodturning. 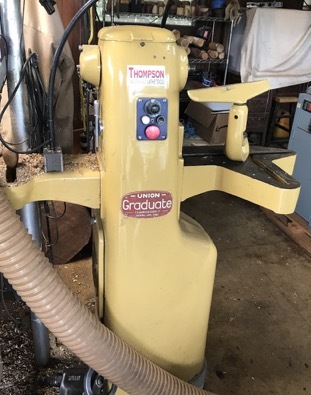 When we went to his shop, he told me he had a newly refurbished in England Union Graduate lathe. I have always wanted one these lathes, and this one has variable speed, new bearings, the same spindle size than may Stubby lathe, and lots of accessories. A few weeks ago, I got the call! He was ready to sell her! Moving her wasn't easy, but with Wayne Omura's help we got her back to my studio. I had to built a base for her, to get her to the right height. I have done quite a bit of turning on her, she's super steady , quiet and smooth. I have named her "My Lady" I want to officially welcome her to KEA woodturning studio, may yo u have many years of happiness !